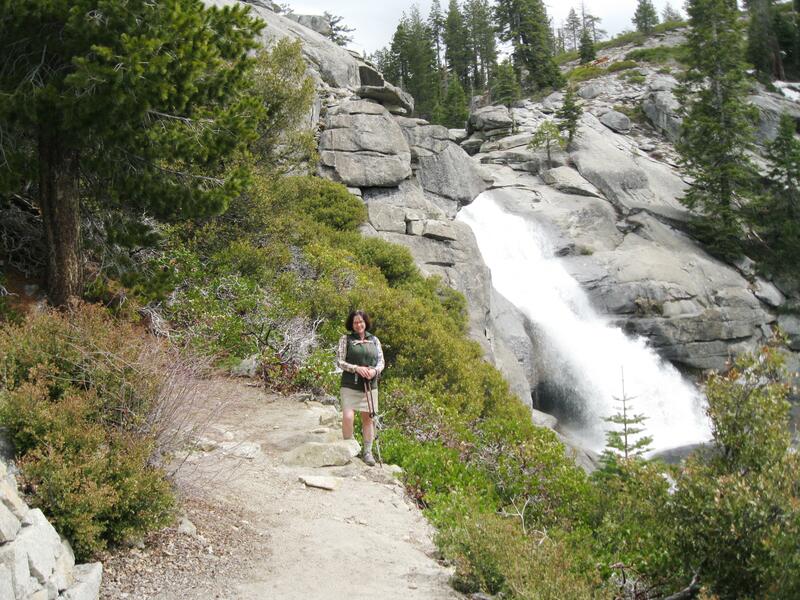 Each year since 2010, Andrew and I have hiked the Chilnualna Falls trail located at the southern end of Yosemite National Park near the town of Wawona. We’ve hiked it in spring, summer and fall. In July it was hot and buggy. 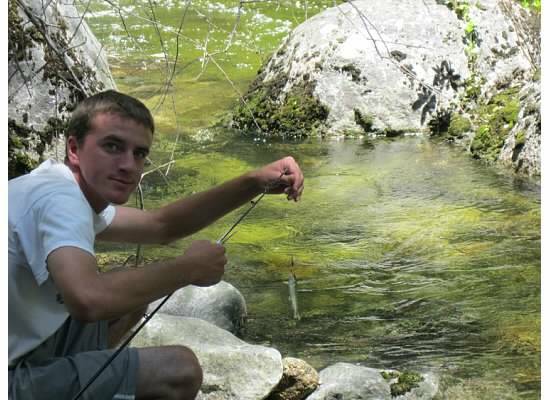 That year Andrew brought his fishing gear and fished in the creek. It was the only time we saw wildflowers. Fishing at Chilnualna Creek. July, 2010. We’ve gone up and back in November when it got dark early making for an eerie walk through the forest; and in April when there was still snow on the ground. 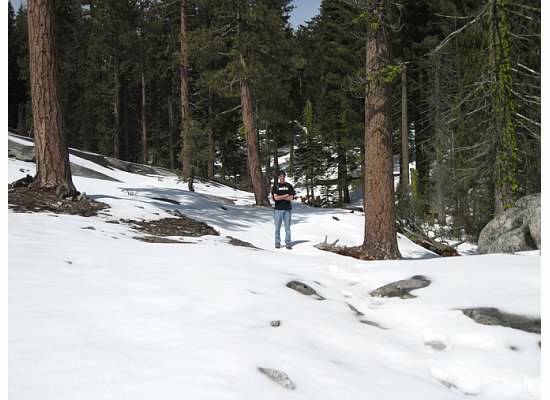 This March was the earliest we’ve hiked it and there was no snow even up at 6,500 feet. 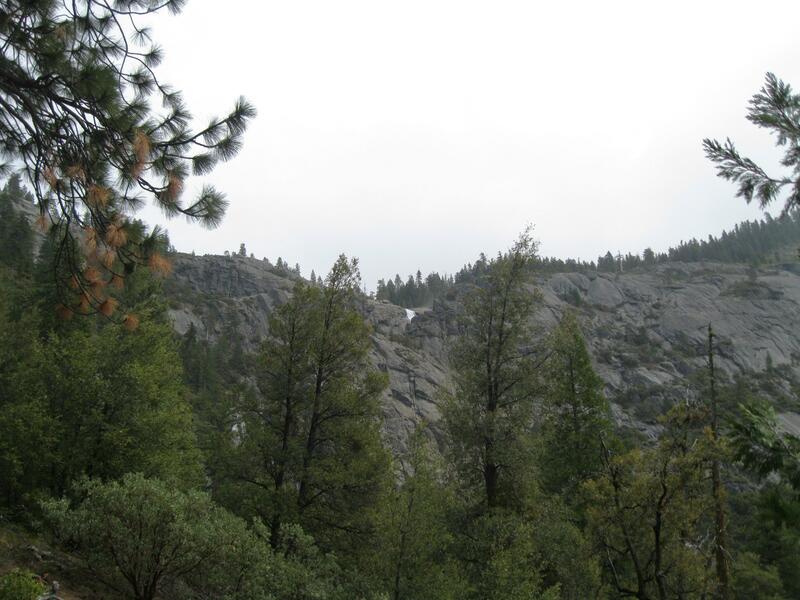 It was a cool, cloudy day as we began the climb to the cascading falls. 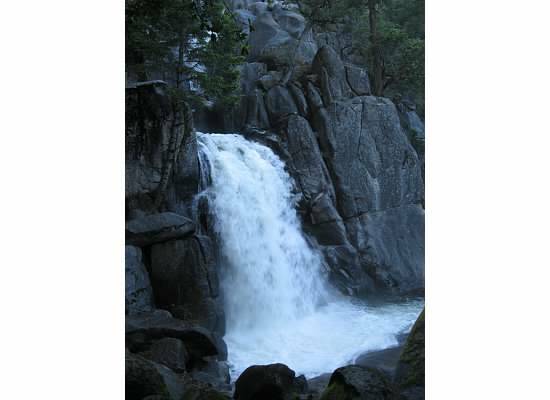 You cannot view this waterfall in its entirety, just a section at a time. 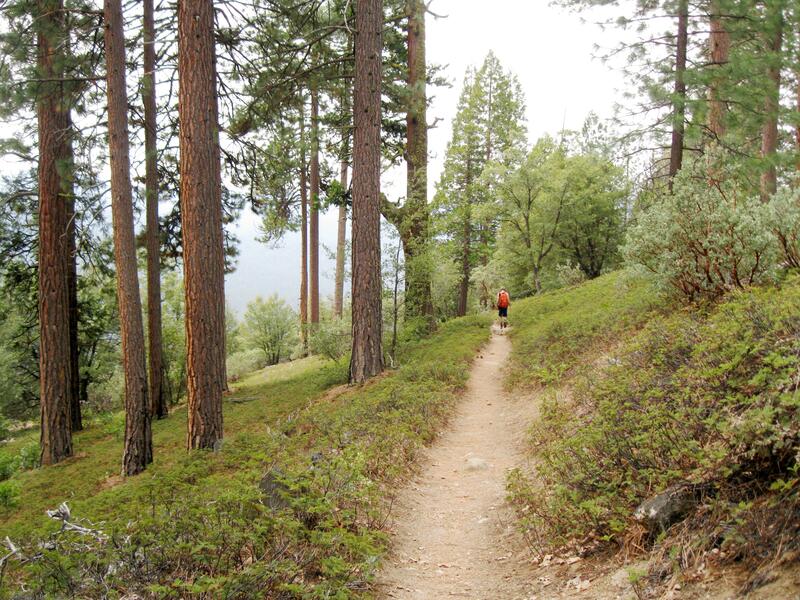 The first quarter-mile of trail was very narrow and rocky. 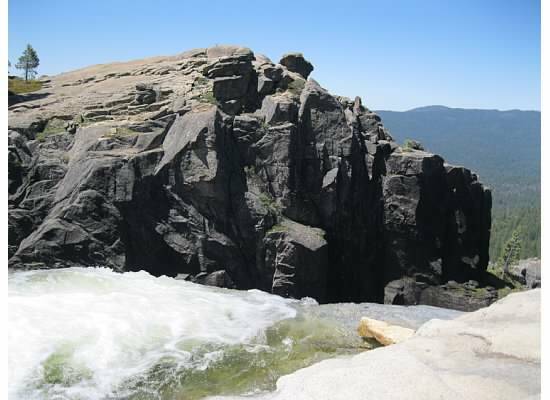 Granite boulders carved into giant steps led us to the base of Lower Falls. There is an alternate trail available, the easier pack trail, but we would miss seeing Lower Falls if we took that route. 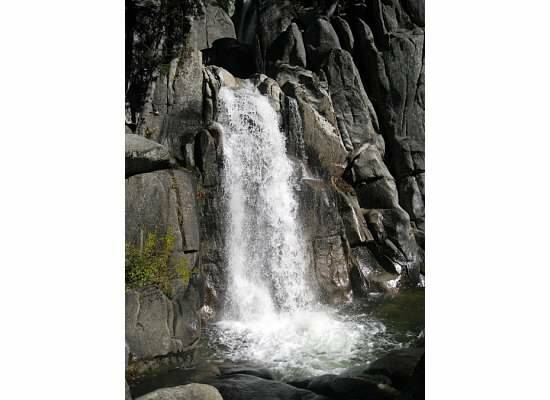 The trail takes you up close to Lower Chilnualna Falls. From Lower Falls, a switchback led us to another narrow mountainside covered with slippery oak leaves and pine needles. Once these two sketchy areas were traversed, the rest of the walk through the Yosemite Wilderness was pleasant. The trail ushered us up higher as we walked through a thicket of giant old manzanita, some in bloom. 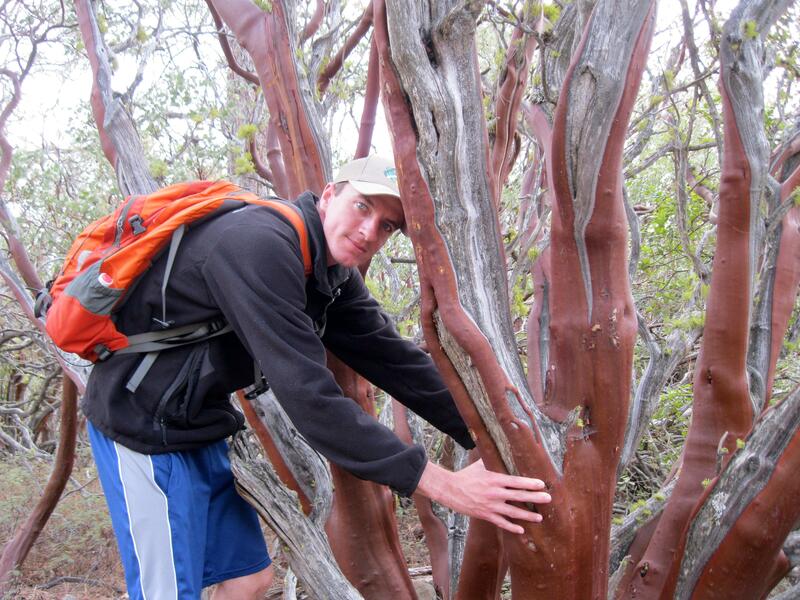 Ruby-colored trunks of manzanita flanked the trail. Stellar’s Jays greeted us with their harsh-sounding squawks as the path wove in and out of the forest and led us through patches of mountain misery (aka bear clover). An easier section of trail. Chilnualna Creek was always within earshot. We crossed over three shallow streams including one with a trickling waterfall right on the trail. An occasional drizzle fell from the gray sky as we made our way around a series of twenty long switchbacks. 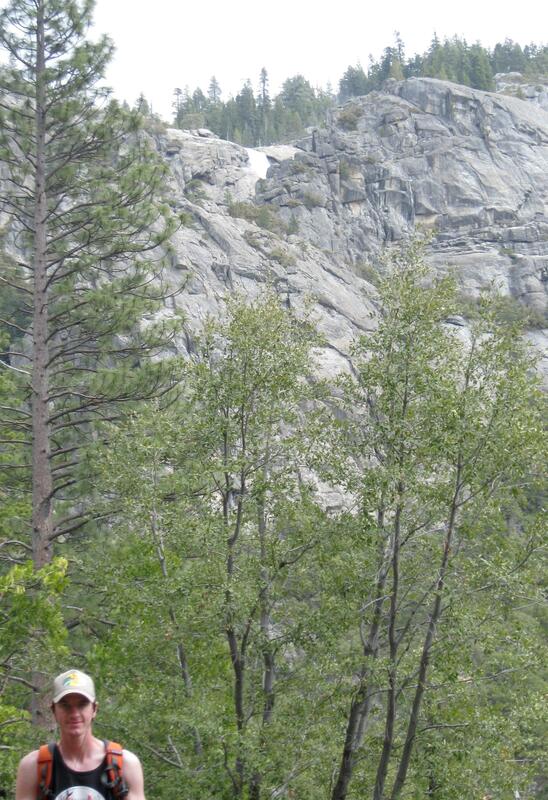 Along the way we were treated with views of Wawona Valley, Wawona Dome, and glimpses of the upper cascades. Looking down at Wawona Valley. Upper Falls in the distance. Getting closer to Upper Falls. We made our way up more steps carved into the side of a cliff until we reached the brink of the largest section of falls. One of several sections of steps. 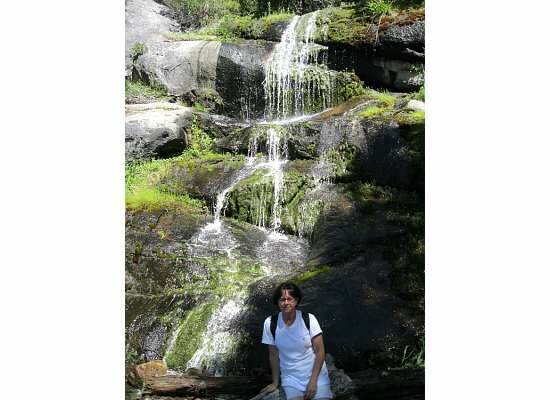 Before we began the hike, I asked my adventurous son to appease me and not get too close to the waterfall at Upper Falls as he had in past years. From here the water drops 240 feet. At the brink of the falls. July, 2010. 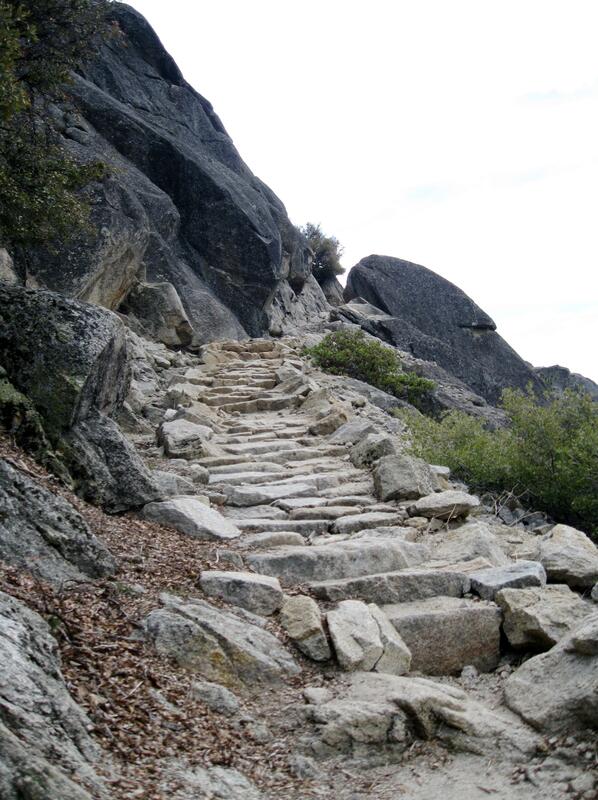 We ate lunch and then continued the march up more granite steps as the trail once again paralleled the raging creek. What you see before the climb to the top. Near the end we jaunted around two more switchbacks to a posted trail junction. The last cascading section of falls could be seen in the distance. Although we travel this path yearly seeing the same views, each trek brings different experiences. 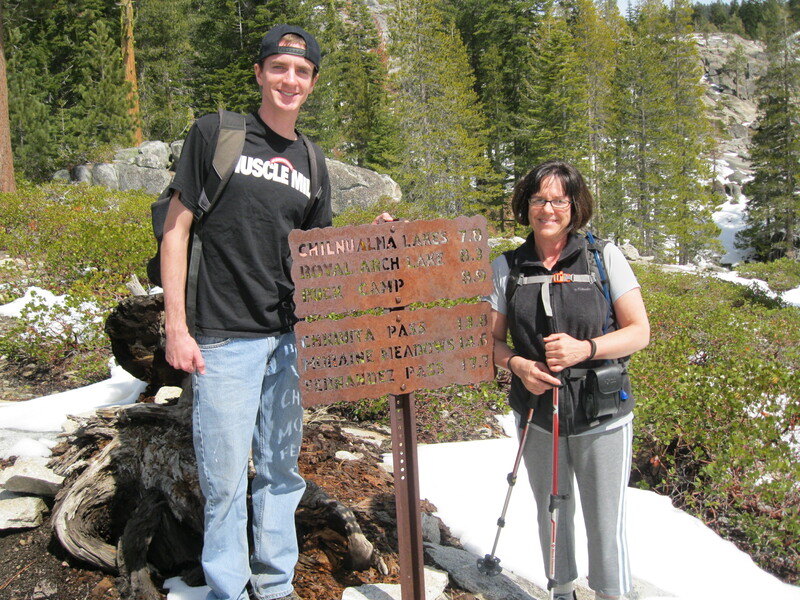 I am blessed to share this time with my son before he moves on in life, or I get too old to do the hike up 2,300 feet. 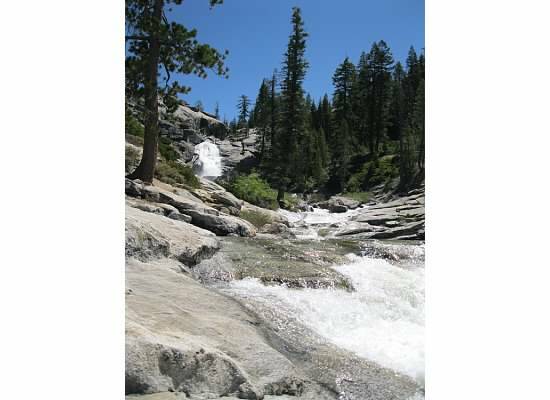 This entry was posted in Yosemite Hikes and tagged Chilnualna Falls, Waterfalls, Wawona, Yosemite National Park on March 29, 2013 by Janet. What a lovely hike, Janet. 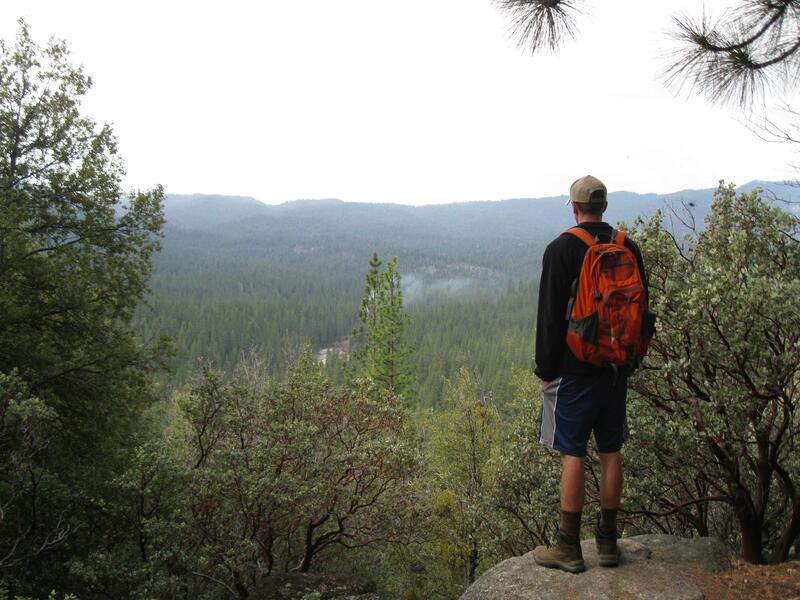 It’s interesting how you can hike the same trail and see and discover new and different things each time you go. 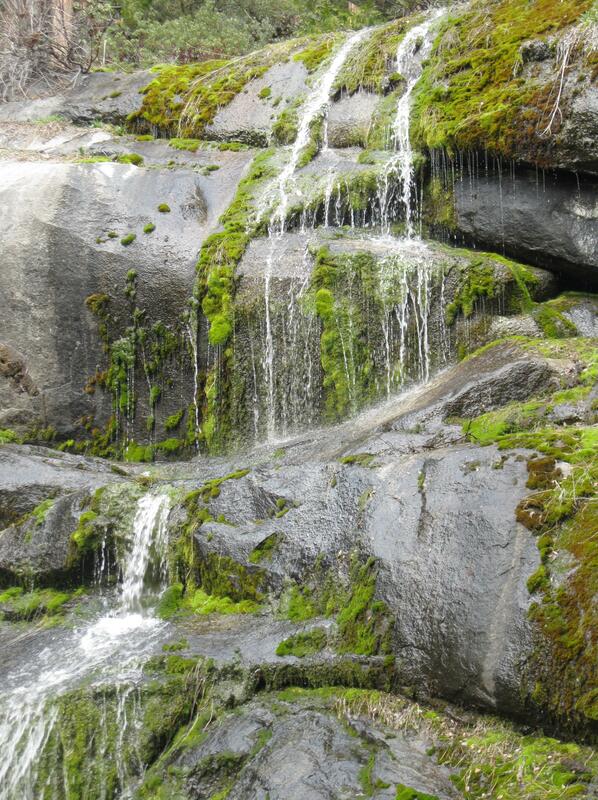 The waterfalls from March 2013 are especially stunning. Thanks for sharing this. Thank you, Kathy. Happy Easter to you and your family. 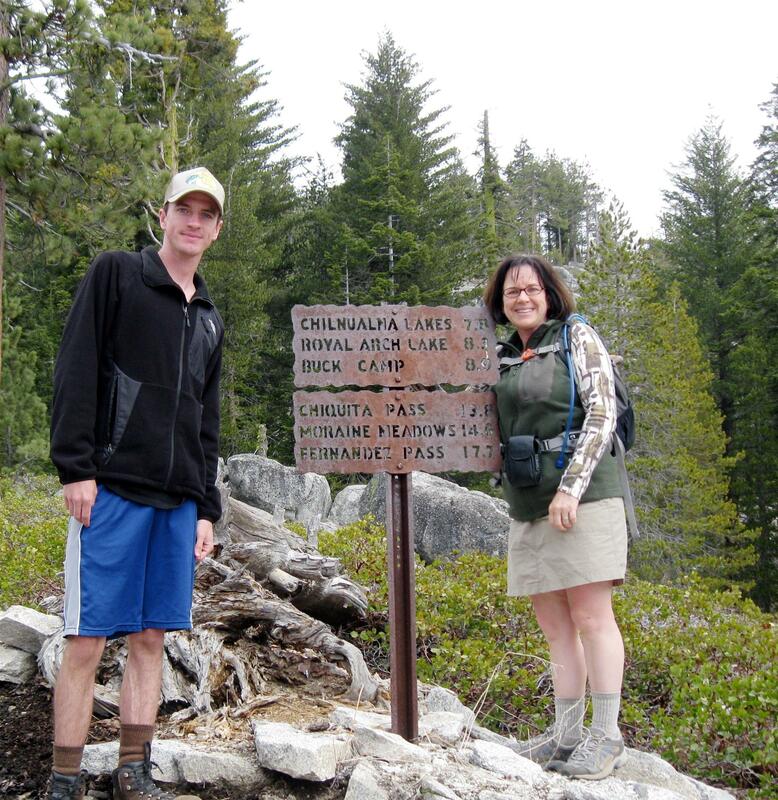 It’s hard to believe so many years have gone by since you started the Chilnualna hike with Andrew. It’s GREAT that the two of you are able to spend that time together. What memories you are making! I loved seeing the comparison photos from the various years. Thanks, Dad. I wish the photos would transfer better. They don’t seem to be as clear as the originals.